The Chinese province of Yunnan was officially brought under the administrative control of Imperial China during the Yuan Dynasty through the Mongol army's southwest campaigns. However, the central government's exertion of control in this remote periphery was not as strong as that in the northern or eastern parts of Imperial China. In many aspects, Yunnan maintained its frontier identity at a crossroads between East, South, and Southeast Asia. The traditional caravan trade that linked China and India can be traced at least to the Han Dynasty, and it remained a vital channel of interaction and exchange for the region throughout history, despite occasional interruptions such as the Sino-Burmese War (1762–69). Even with an increasing Han population and an intensified process of Sinification from the Ming Dynasty onwards, many areas were governed by native officials, who often held multiple, but nominal, loyalties to remote power centres in China, Siam and Burma well into the nineteenth century, a feature which has been identified more with Southeast Asian polities than with their counterpart based in Beijing. However, in the late eighteenth century, this balance was abruptly interrupted by the arrival of the European colonial powers. The expanding northeastern frontier of the colonial state of British India (or of its predecessor until 1857, the East India Company) was directly confronted by Imperial China's southwest periphery. Unlike contemporary confrontations along the southern and eastern coasts of China, Yunnan experienced neither wars nor concessions of its territories. Nevertheless, the colonial presence challenged the free-flowing tradition of the frontier, and to some extent, defined Imperial China's southwest border immediately prior to the fall of the Qing Dynasty. The current study looks at one group from this frontier region, the Han Yunnanese, who traditionally sojourned between western Yunnan and Upper Burma. In response to the approaching colonial presence — and from 1886 onwards, with the newly established colonial rule in Burma — this group underwent a communal transformation with reinforced or newly created identities, which reflected the demarcation of political borders and the delineation of ethnic boundaries in one of the remotest peripheries of Imperial China and in its southern neighbour, Burma. The present King of Cochin China is the true heir and direct lineal descendant of the ancient royal house of Siam, which was extirpated by the Burmans around the year 1750; and as the present Siamese government is weak and distracted, it has for some years been considered a very probable occurrence, that he will soon find or take an opportunity of asserting his claims to the throne of Siam. Though this Prince has derived great assistance from the French in his dominions, on many occasions, he is obviously jealous of all European interference and can only be considered under the influence of the maxims of Chinese policy…. It is not… probable that any thing more than a very limited and hampered trade would ever be permitted with Cochin China; and this will be the more apparent if we consider the humiliating and slavish manner in which all traffic still is, and has been, carried out with both Cochin China and Siam. … It is obvious that trade of this type is by no means accommodated to the habits of Englishmen. Little did Raffles, the future founder of British Singapore, understand that the role he would be playing in East and Southeast Asian courts was that of an inferior luminary paying tribute to imperial or royal “North Stars”. Vietnam is geographically very close to the Leizhou Peninsula and to Hainan Island, and the human connections between these sites go back thousands of years. But what is the history and nature of these connections? We note that the Leizhou Peninsula and Hainan Island do not share land borders with Vietnam, as Guangxi and Yunnan provinces do, for example, and that they do not share Vietnam's strong economical development, so we may ask whether these entities were loosely or closely connected with the Red River Delta. We know rather little about the matter largely because trade in this region was primarily carried out by peddlers rather than by big merchants, and it therefore was rarely recorded. As a result, among all the Chinese peripheries, the connections between Vietnam and the Leizhou Peninsula and Hainan have been the least known. Archaeological findings, however, suggest long and deep connections between the various coasts of this region. For example, among all the coasts of Guangdong, bronze drums are found most numerously in the Leizhou Peninsula. Together with the bronze drums found in Guangxi and on Hainan Island, this makes the Leizhou Peninsula stand out for its evident connections with Vietnam, and it highlights the unity of the Gulf of Tongking as one region from the time of antiquity. Local gazetteers of Hainan and Leizhou also record official connections between these coasts. A search of the biographies of scholars recorded in these local gazetteers indicates a striking phenomenon: the scholars of Leizhou and Hainan provided the majority of lower officers during the twenty years of Ming occupation of Vietnam (AD 1407–28). This fact might be the tip of an iceberg. What connected the different peoples on these disconnected coasts still largely remains a mystery. This paper attempts to offer insights into these connections. It starts by examining epidemic data of the seventeenth and eighteenth centuries in this region, then moves on to look at the trade within, and the local worship shared throughout, the region. These data seem to suggest a rather surprising frequency and intensity of contacts among the peoples in this region. As such, this paper tries to shed some new light onto this shadowy corner of the South China Sea. 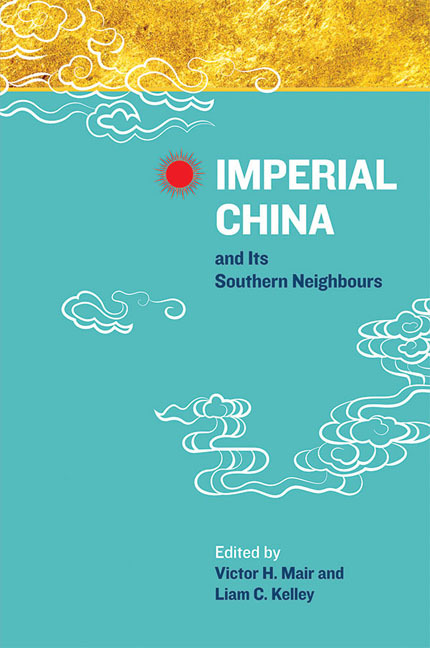 This volume is composed of papers presented at the international conference on “Imperial China and Its Southern Neighbours”, organized by the Nalanda-Sriwijaya Centre, Institute of Southeast Asian Studies (ISEAS), Singapore, and held at ISEAS on 28–29 June 2012. The northern periphery of China, from the late Neolithic and the Bronze Age up to modern times, has been carefully scrutinized, both by Chinese scholars and foreign researchers. Even traditional Chinese sources, such as the standard histories, devote considerable attention to the peoples, cultures, and states of the northern and northwestern border regions of the Chinese heartland. Since the Chinese state began in the northern portion of its current configuration and received demonstrable, formative inputs from the north and northwest, it is understandable that correspondingly greater attention would be paid to the north than to the south, particularly during the early periods of the development of the Chinese nation. In contrast, the southern rim of China has been relatively poorly studied, despite the fact that the languages, ethnic groups, and cultures of the south are every bit as complex, interesting, and important as those of the north. In this conference, we aimed to remedy this disparity by giving due emphasis to the south as a vital region of social, economic, and cultural interaction between Sinitic and non-Sinitic peoples. First, however, we had to recognize that “the south” has not been a fixed entity or a static, welldefined region during the last three millennia of Chinese history. Rather, it has been defined by a continuously changing, amorphous boundary with the north. Indeed, there has been a gradual encroachment of the north upon the south. This was already documented in modern scholarship more than half a century ago by Harold J. Wiens, China's March Toward the Tropics (1954, also published under at least one other title), and C.P. Fitzgerald, The Southern Expansion of the Chinese People (1972). A dramatic change occurred around the time of the fall of the Western Jin Dynasty (265–316) and the founding of the Eastern Jin Dynasty (317–420). This was a time of crisis in the northern heartland, one that was precipitated by climatic distress and consequent geopolitical realignments. The net effect was to catapult large numbers of northerners southward, quickening the pace of expansion and assimilation. Past researchers have traditionally viewed ancient Southeast Asia as having been influenced by a virtually unidirectional flow of culture and civilization. Prior to the mid-1960s, many researchers explained the development of large-scale, complex societies (e.g., kingdoms and states) in Southeast Asia by pointing to influence from the more “advanced” civilizations of ancient India and China, citing the transmission of advanced technology and political models by diffusion, migration, or simple military and cultural imposition. Traditional perspectives from the early twentieth century viewed Southeast Asian societies as derivatives of Indian and Chinese counterparts. Intensified archaeological research efforts in recent decades throughout much of the region, however, have increasingly shown these sorts of positions to be untenable, demonstrating a model of unidirectional influence to be overly simplistic. To be sure, communities all over Southeast Asia were in either direct or indirect contact with one another and counterparts in India and China. But the countries of “China”, “India”, and Vietnam of today did not exist at 2000 BP, and the wider region was home to a kaleidoscope of societies. Modes of interaction and resultant social changes were complex, multilateral, and multidirectional. Societies were engaged in significant forms of interaction that included extensive long-distance trade, the movement of peoples and ideas, and cycles of peaceful relations and warfare. This situation of complex interactions is evident throughout much of Southeast Asia, and the area of modern-day northern Vietnam is no exception. In this paper, I examine the important cultural frontier that existed between emerging Sinitic and proto-Vietnamese civilizations during the closing centuries BC, focusing specifically on archaeological evidence from the Red River Delta. To reconstruct cultural developments for the area's pre-and proto-history, a combination of textual and archaeological sources are crucial for understanding amorphous cultural boundaries and changing patterns of sociopolitical and economic interactions. During the first centuries BC and AD, the Han Empire began annexing the Red River Delta, as related by historical accounts and other traditions. At the time, a number of important cultural changes were taking place in the adjacent areas of modernday southern China and northern Vietnam. Sixty years ago, a newly unified China was established, and its new leaders began to look southwards afresh. What they saw was a region that had been transformed by five centuries of a global maritime trade that eventually spawned several European empires. During that period, and especially in the nineteenth century, the earlier trading empires of the sixteenth to eighteenth centuries evolved into national empires as nationstates developed out of feudal and absolute monarchies. Some, like those of Britain and France, were greatly enriched and strengthened by the scientific and industrial revolutions and their large capitalist enterprises spread across the globe. By the first half of the twentieth century, however, the rival empires in Europe had turned on themselves, and this led them to fight two world wars. In the Asia that they had dominated since the early nineteenth century, their destructive conflicts produced many revolutionary changes, for example, the rise of a modern Japanese empire, the destruction of imperial China, new divisions on the Indian subcontinent and, at the end of the Second World War, the emergence of Southeast Asia as a selfconscious region with nationalist leaders who were dedicated to the task of building nation-states out of former colonial territories. The region's newfound self-awareness was enhanced by the common experience, for three and a half years during the Second World War, of having been under the dominance of a single, the Japanese, empire. This was the first time that the various kingdoms and ports and their peoples had ever come more or less under the control of one imperial power. By the time China was reunified in 1949, some of the leaders of the countries to China's south were beginning to discover that they could together develop a distinctive identity for the region, and that it was in their interest to consider doing so as soon as they could. Spurred by anticolonial movements that embarked on the task of nation building, inspired by modern concepts of sovereignty, freedom, equality, and economic development, their leaders and scholars found new perspectives from which to examine the history of China's relations with the region. For a while, the new countries were divided by the Cold War. 5 - What Makes a Chinese God? or, What Makes a God Chinese? Over the course of a thousand years roughly equivalent to the first millennium AD, the Sinitic culture of the Yellow River basin came into contact with the south, the culturally and ethnically divergent lands of the Yangzi River basin and beyond. By the Song Dynasty, which straddles the end of the first and the early second millennia, much of the south had become a full partner in the definition of a new emerging culture. Although this new culture drew heavily on the Sinitic heritage of the Central Lands, it was not simply an extension of the Sinitic world. On the contrary, the new culture that emerged through the course of this millennium, the culture we today call “Chinese”, was a hybrid entity, drawing as much on the non-Sinitic models of the south as on the Sinitic heritage of the north. In this chapter, I intend to show how cultures merged in southern Fujian province to create a hybrid culture. Although there are many avenues through which I could make this case — family structures, economic activities, and cropping come readily to mind — in this chapter, I will focus on religious expression. Across much of China cults devoted to local deities have long been among the most important expressions of culture and local identity. However, whereas deities whose roots lay in the northern culture such as the Queen Mother of the West, Guan Yu, or Zhenwu Xuandi were often identified conceptually either in connection with direction or specific function, those of the south were more often identified as protector deities of designated locales. Although some deities with origins in the south gained broad followings, most cults remained strictly local, sometimes never spreading beyond a single shrine. In the following discussion, I will examine a range of cults that took shape in southern Fujian during the period between the later Tang and Song dynasties in southern Fujian province in an attempt to address two parallel questions: What makes a Chinese god? or What makes a god Chinese? As the Sinitic immigrants entered the alien lands of southern Fujian through the middle of the first millennium, they encountered the indigenous people. This encounter sometimes led to conflict, and other times unfolded more smoothly. Both outcomes, however, found expression in local cults that survive to the present. In the past decades, we have witnessed academic articles and monographs published at an astonishing rate on the cultural interactions between Tibet and China. These studies have tended to focus on the religious ideas and practices influencing the elite class, namely the Tibetan Buddhism that interested the rulers of the Yuan, Ming, and Qing dynasties. Tibetan influence on the popular culture of the Chinese has been largely ignored. This is partly because the Tibetans have never been rulers of the East Asian Heartland. Moreover, for geographic and historical reasons, Tibet was — until the 1950s — a mystical and hermetically enclosed society in the Chinese imagination. It has consequently been believed that Tibetan culture could not have any direct or lasting effect on Chinese society during the imperial period. This study aims to challenge these assumptions, and to rethink Sino- Tibetan cultural communications from a different perspective. We begin with a survey of the surviving textual records on the usage of the peacock's gallbladder and the image of the peacock, revealing several clues for further exploration. Following these clues, we close in on the origin of the peacock's gallbladder as a lethal poison in the Tibetan culture of medicine and pharmacy. We examine the introduction of Tibetan medicine to China under the Mongol rule, and its tremendous impact on the Mongol elites in the second section of this paper, and focus on the medicinal usage of the peacock's gallbladder recorded in two major works of Tibetan materia medica, namely the rGyud-bZhi and the Shel gong shel phreng, in the third section. Lastly, we discuss the possible Buddhist influence on the reception of the peacock in Tibetan tradition. A pharmacologist would point out that the “peacock's gallbladder”, at least as a poison, simply does not exist: like the gallbladders of many other birds, it is in no sense toxic. Why, then, did this story, so at odds with any kind of fact, survive? What is the peacock's gallbladder? Can we associate the poisonous mythical “peacock's gallbladder” with the actual gallbladder of a peacock? Alternatively, is the item in question something possessing a fancy name but actually having nothing to do with the peacock? An examination of the history of the myth, especially regarding the cultures that have accepted it, may help answer these questions.